Nebraska Lutheran Campus Ministry's (NeLCM's) 2013 Pillar of Fire will be held this weekend, February 1 & 2, at Carol Joy Holling Camp near Ashland, Nebraska. Forty-two students and staff from six of NeLCM's ten ministry sites (Beatrice, Kearney, Lincoln, Midland, Norfolk, Omaha-UNO, & Wayne) will gather for worship, fellowship, pseudo-competitive winter "Olympic" events & other games of skill, wisdom, and chance. 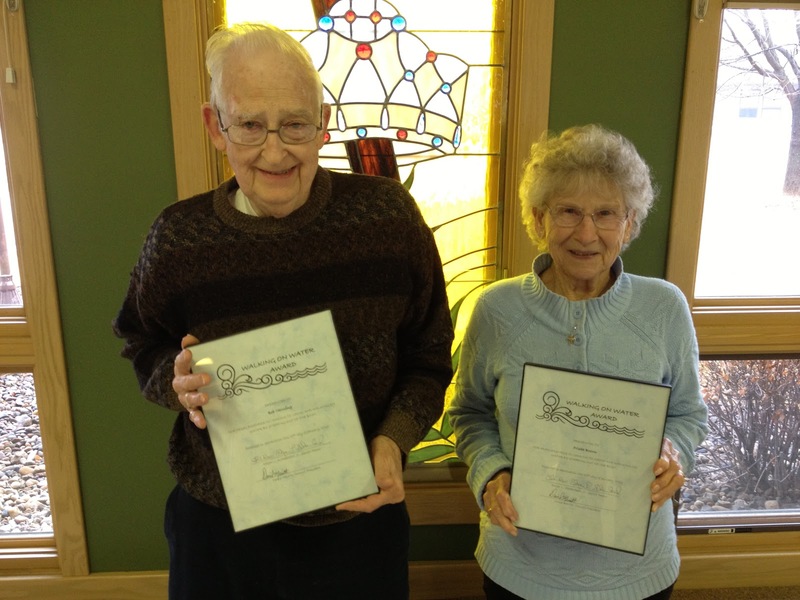 Bob Henning & Frieda Brown were the recipients of Walking On Water Awards at St. John's 2013 Annual Meeting. These awards were presented for their fearlessness in looking to grow and walking on water by stepping out of the boat. Both Bob & Frieda were happy, humbled, and honored to receive these awards. We congratulate and celebrate with them and their faithfulness! St. John's Lutheran Church in Norfolk, Nebraska, held its 2013 Annual Meeting on Sunday, January 27, 2013, beginning with a potluck meal at Noon, followed by the meeting at 1 p.m.
Because of the seriousness of the decision St. John's is facing with regard to staffing and funding of ministry in 2013, the Church Council recommended that the congregation delay the adoption of the proposed 2013 General Fund Budget until a special congregational meeting to be held on Sunday, February 24, between the worship services. The congregation voted in favor of this proposal, 66-44. If you were unable to attend the meeting, Annual Reports are available in the church office. A reminder: this Sunday, January 27, 2013, following our 11 a.m. Celebration Worship service at approximately Noon, we will hold a Potluck Dinner, featuring a variety of delicious dishes that will come from whatever you and your fellow members of St. John's bring to enjoy. Following the Potluck Dinner, at approximately 1 p.m., St. John's Annual Meeting will be held. All voting members are encouraged to attend this meeting. The meeting will include discussions on the 2013 proposed general fund budget, which includes staffing changes, as well as voting on new Church Council members, a new member of the Benefaction Board, and lay voting members for the 2013 Nebraska Synod Assembly, which will be held May 31-June 2, 2013, in Kearney, Nebraska. Funeral services for Veona Rasmussen, age 90, will be at St. John's on Saturday, January 26, at 10:30 a.m., with Pastor Justin Wiese & Betty Schambach officiating. 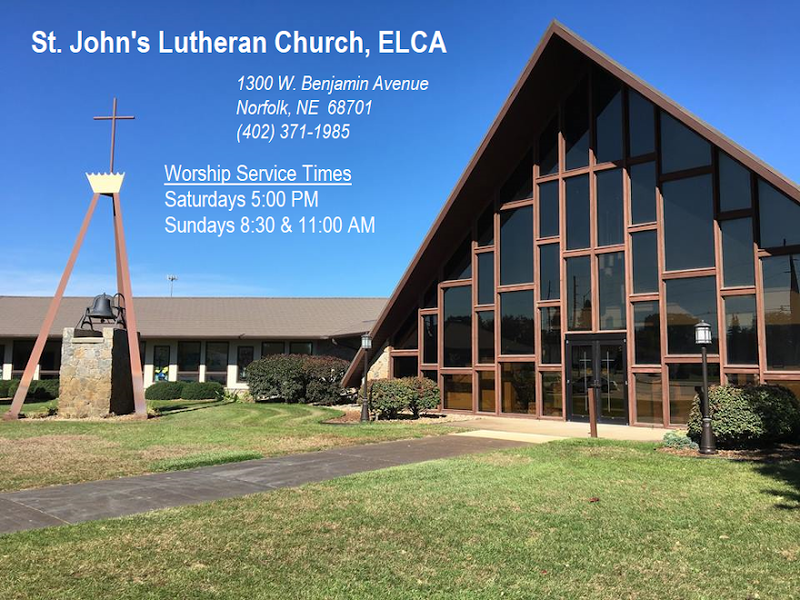 A luncheon will follow immediately after worship in the St. John's fellowship hall, and committal at Pleasant View Cemetery in Plainview will follow the luncheon. See Veona's obituary below. Graveside services for Helen L. Blatt, age 98, formerly of Norfolk and long-time member of St. John's, will be 2:30 p.m. Thursday, January 24, 2013, at Prospect Hill Cemetery in Norfolk, with Pastor Justin Wiese officiating. View Helen's obituary & connections with St. John's below. Click here to view the Bulletin Announcements for January 19-20, 2013. Funeral services for Jim Wilcox will be held Saturday, Jan. 19, at 10 AM. A meal will be served following the service at the Norfolk VFW. Be sure to attend the Financial Forum on Sunday, Jan. 20, at 9:45 am. Important matters will be discussed regarding proposed staffing cuts and the 2013 budget. Funeral services for Ken Sunderman will be held Wednesday, January 16, at 10:30 am. Blessed are those who die in the Lord. Dave Ramsey's Financial Peace University will not be offered at this time as previously stated. Watch for announcements after the Easter season about this upcoming opportunity! Below are the words that Pastor Justin said while writing with chalk above the doors at church this weekend. This didn't make it into the bulletin, so here's your online exclusive extra! 13: and thirteen years ago. +: and remain with us throughout the new year. On May 22, 2011, a multi-vortex EF-5 tornado ripped a 13-mile path of destruction through Joplin, Missouri and its neighboring communities. The devastation left behind was impossible to imagine, affecting thousands of residents and taking 162 lives. While the storm hit well over a year ago, much work remains to getting the community fully back on its feet.